These old fashioned bar cookie recipes are easy to make from scratch, and you'll love how they turn out. 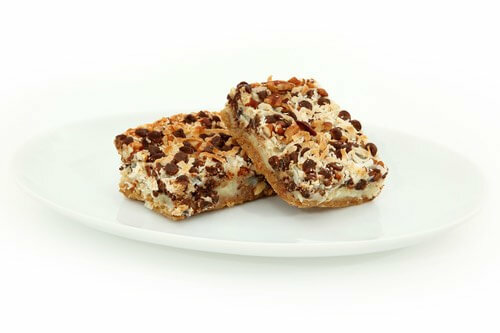 Enjoy the delicious taste of homemade dessert bars in a variety of all-natural flavors including marshmallow, coconut, peanut butter, walnuts, caramel, dates, and rich creamy chocolate. Are they bars, squares, or candy? You decide. 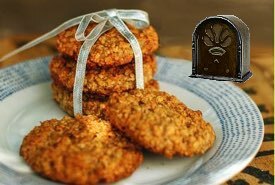 Use these vintage bar cookie recipes to make tasty treats perfect for serving at parties, picnics, and for placing in school lunchboxes for a delicious homemade treat. Talk about your comfort foods, these homemade cookies will leave you wanting more, so plan to double the recipe or make two or three varieties. By the way, an assortment of flavors makes a perfect homemade gift for someone special. 1/4 cup butter, 1/2 cup grated chocolate, 1/2 teaspoon vanilla, 1/2 pound marshmallows, 5 cups rice cereal. Melt butter and marshmallows over boiling water, stirring often. Add vanilla and beat well. Mix well with cereal and chocolate. Press into a large buttered pan; when cool, cut into sticks or bars. 2 cups moist coconut (shredded), 1/2 cup peanut butter, 4 teaspoons vanilla. Mix all ingredients, keeping back 1/2 cup coconut; shape mixture into small bars and roll in remaining coconut. One pound tin of dried milk powder, 1 cup boiling water, 7 tablespoons sugar, 4 tablespoons cocoa. Dissolve sugar in water, then add to dried milk and cocoa, mix it well. Place layer of chocolate in a flat tin, next a layer of the filling, and top with a layer of chocolate. Set overnight and cut into small bars. Vanilla Cream Filling for Bars: Mix 1/2 pound icing sugar to a stiff paste with 1 tablespoon condensed milk, 1 teaspoon vanilla. This easy bar cookie recipe makes enough cookie dough for both fruit fillings, or for one fruit filling doubled in quantity. Combine chocolate and milk in top of double boiler. Cook over boiling water until blended and thickened, stirring constantly. Add 1/2 cup brown sugar and continue cooking 5 minutes. Allow to cool. Sift flour once, measure, add baking powder and salt, and sift again. Cream butter thoroughly, add 1 cup brown sugar gradually, and cream together until light and fluffy. Add egg and beat well. Stir in chocolate mixture, milk, and vanilla. Add flour all at once and mix well. Chill overnight or until firm enough to roll. Divide dough in six equal parts. Roll each portion of dough 1/8 inch thick on slightly floured board, into rectangular sheet 4-1/2 x 12 inches. Spread 1/3 cup filling in 1-1/2 inch strip down center of dough. Fold dough over filling, brush edges with milk, and seal. Place seam-side down on ungreased baking sheet and brush with milk. Bake in moderate oven (350°F) 20 minutes, or until done. Let cool in pan 5 minutes, then cut diagonally in bars, 1 inch wide. Makes about 5-1/2 dozen bars. Combine 2/3 cup ground figs, 3 tablespoons sugar, 1/3 cup water, and 4 teaspoons grated orange rind in saucepan. Cook about 4 minutes, or until thickened, stirring constantly. Add 1-1/2 teaspoons lemon juice and 1/2 cup coarsely chopped walnut meats. Cool. Makes about 1 cup filling. Mix 3 tablespoons sugar, 2 1/2 teaspoons cornstarch, a dash of salt, and 2 tablespoons canned pineapple juice in top of double boiler. Add 2/3 cup canned crushed pineapple, well drained. Place over boiling water and cook 12 minutes, stirring occasionally. Add 1 1/2 teaspoons lemon juice and 2/3 cup flaked coconut. Cool. Makes 1 cup filling. Preheat oven to 350°F (325°F for glass dish). In 13 X 9-inch baking pan, melt butter in oven. Sprinkle crumbs over butter; pour Eagle Brand® evenly over crumbs. Top with remaining ingredients; press down firmly. Bake 25 to 30 minutes or until lightly browned. Cool. Chill thoroughly in fridge and cut into bars. Store loosely covered at room temperature. Makes 2 to 3 dozen bars, depending on the size you make them. 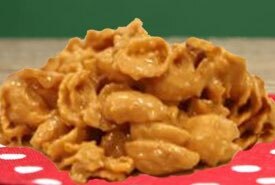 1/4 cup butter, 1/4 cup lard, 1/4 cup boiling water, 1/2 cup brown sugar, 1/2 cup molasses, 1 teaspoon soda, 3 cups flour, 1/2 tablespoon ginger, 1/3 teaspoon grated nutmeg, 1/8 teaspoon clove, 1 teaspoon salt, chopped walnut meat. Pour water over butter and lard, then add sugar, molasses mixed with soda, flour, salt, and spices. Chill thoroughly, roll one-fourth inch thick, cut in strips three and one-half inches long by one and one-half inches wide. Sprinkle with nutmeat and bake ten minutes. 2 tablespoons brown sugar, 1/8 teaspoon salt, 1/4 cup butter, 1/4 cup boiling water, 1/2 cup brown sugar, 1/2 cup flour, 2 tablespoons English walnut meat finely chopped, halves of walnuts or almonds to garnish. Caramelize two tablespoons sugar, add butter and water, and boil two minutes. Remove from fire, add remaining sugar, flour mixed with salt, and walnut meat. Spread as Rolled Wafers. Crease in two-inch squares, and decorate with nutmeats. Bake in a slow oven, and remove from pan at once.